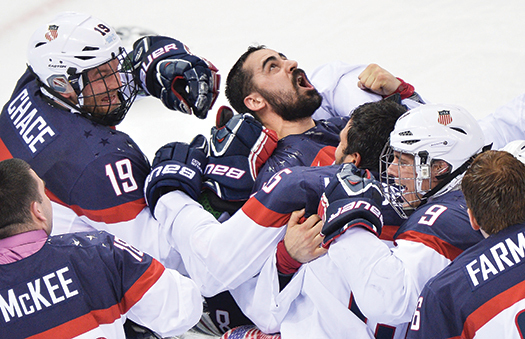 U.S. Sled Team goaltender Steve Cash is mobbed by his teammates after shutting out Russia, 1-0, in the gold-medal game. Cash surrendered only two goals in the tournament as the U.S. won its second straight Paralympic gold medal. In the lead-up to the 2014 Paralympic Winter Games, head coach Jeff Sauer touted Declan Farmer and Brody Roybal as two of the most talented sled hockey players in the world. The question was would they be able to produce in a pressure-packed Paralympic tournament. 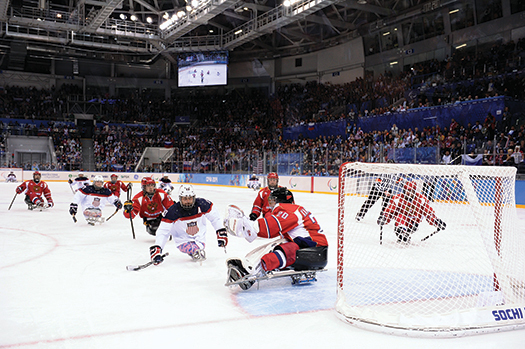 Teamed with 21-year-old Josh Pauls, the “Youth Line” line was front and center for the U.S. offensive attack that paced the team to its second straight Paralympic gold medal. It’s the first time in the history of the sled tournament, dating back to 1994, that a country repeated as gold medalists. The Pauls, Farmer, Roybal line produced six goals and five assists in five games, including all three in a 3-0 semifinal win against Canada. And they got better as the tournament went along. Even when they weren’t scoring, the Youth Line was buzzing around the offensive zone, controlling play and creating numerous scoring chances. The chemistry formed during the pre-Paralympic games was evident, with all three knowing where each other was on the ice, as was the case with their third goal against Canada. Farmer blocked a shot that ricocheted deep into the Canadian zone, retrieved the puck behind the net and fed a perfect pass to a streaking Pauls, who buried the shot. “For those two guys to play as phenomenal as they did and handle the pressure, they handled it extremely well,” Pauls said of his two young linemates. As the elder statesman of the line, Pauls proved to be the perfect mentor for Farmer and Roybal after dealing with the Paralympic pressure as a 17-year-old in Vancouver. But they were able to be successful thanks in large part to the overall depth of the team assembled by general manager Dan Brennan and the coaching staff. While Sauer mixed and matched players throughout the tournament to get different guys into the lineup, his top two lines remained constant. “Bravo-Delta,” the line with military veterans Josh Sweeney, Paul Schaus and Rico Roman, was a menacing force throughout the tournament. They played shutdown hockey and were relentless on the forecheck. Their efforts were the difference in the gold-medal game. After a 23-shot performance in the preliminary round loss to Russia, the U.S. only put four shots on Russian goalie Vladimir Kamantcev in the gold-medal game. But one of them came off the stick of Sweeney, who intercepted a breakout pass and beat Kamantcev top shelf. Relentless pressure on the forecheck led to the only U.S. goal against Russia as Josh Sweeney forced a turnover and then beat goaltender Vladimir Kamantcev high to the glove side. “Forechecking is what I do, so I started to forecheck and he popped it out in front of me. I tried to make the goalie think I was going to go left but he didn’t bite as much as I wanted. I just had to roof it,” said Sweeney, who also scored in the opening-game victory against Italy. The U.S. was wary in their rematch against the Russians, who were competing in the Paralympic sled tournament for the first time. In their first matchup, it took a 5-on-3 power-play goal and a goal on a fluky bounce off Roybal’s sled, but they were able to beat U.S. goalie Steve Cash twice in a 2-1 upset. As it turned out, those were the only two goals Cash, who lived up to his nickname “Money,” has allowed in 11 career Paralympic games. “We came to play and left it all out on the ice. Normally when that happens you come out with a ‘W,’” said assistant coach Guy Gosselin of the loss against Russia. “The big thing was I felt if we came out and gave the same type of effort that we did the other night that we would be in pretty good shape,” added Sauer, who is in his third season coaching the team. With the game being broadcast live on NBC, the sport had its moment in the limelight. The players and coach hope that piqued interest in sled hockey will help grow the game in the U.S. While the U.S. didn’t shut out the competition like it did in 2010, the end result was the same. And that is, ultimately, all that matters.